It is Wednesday morning, and Herbert Pearson is ready to learn. Pearson sits at a round table scattered with worksheets, books, and a small whiteboard. He reads a passage aloud from a book, pronouncing each word slowly but steadily. When he gets to one line in the story about a group of friends, he pauses and laughs at something the character says. Pearson’s tutor, Barbara Waltz, seated next to him, is reading the same book. She peers at the passage, laughs a little, too. “This book has interesting characters,” she says. Pearson continues reading and reaches a word that makes him pause. “That word rhymes with ball,” Waltz says. The clue helps Pearson figure out the word quickly, and he continues with the story until he is finished reading. It is through this partnership—between learner and tutor—that stronger readers, better-prepared workers, and more-engaged community members are built, said officials at The Literacy Council (TLC) of Central Alabama, which helps a little more than 2,300 residents in the five counties it serves improve reading skills, learn to speak and read English, or attain a GED diploma. There are more than 92,000 illiterate adults in central Alabama, according to TLC, which has 275 active tutors across Blount, Jefferson, St. Clair, Shelby, and Walker counties. So, several days a week the organization opens the doors of its brightly lit First Avenue North location to learners. The facility is populated with learners and tutors at tables in an airy reading room filled with donated books or who practice reading in more-private cubicles. There are also one-on-one sessions in the building’s library. Following a curriculum, tutors guide learners through phonics worksheets, as well as books and newspapers written specifically for adults on lower reading levels. TLC also offers classes at the Kingston Community Center and the new North Birmingham Salvation Army Center for Hope. Classes for GED preparation and English for non-native speakers are offered at locations throughout a five-county area. A broad range of readers, ages 20 to 88, attend myriad TLC classes—and “Everybody has a different goal,” said Watson. Fairfield resident Diane Jones wants to be a better reader. Now Jones attends classes several days a week and has even gained the confidence and ability to read to her granddaughter. Her TLC family even gifted her a book to read to her granddaughter: “Please, Baby Please” by Tonya Lewis Lee and Spike Lee. Jones said she wants to eventually get her GED diploma. While Pearson and Waltz read at their table on that Wednesday morning, Alonzo Goodgame and his tutor, Becky Schultz, are set up in a cubicle reading a newspaper article about the newly elected president in Cuba. Schultz reads the story and asks Goodgame questions about what she has just read. Then, Adrienne Marshall, TLC Director of Adult Literacy Programs, stops by to chat with the duo about sports. Marshall, who was a TLC volunteer for years before she began working there, said most people who turn to the organization are looking for independence. 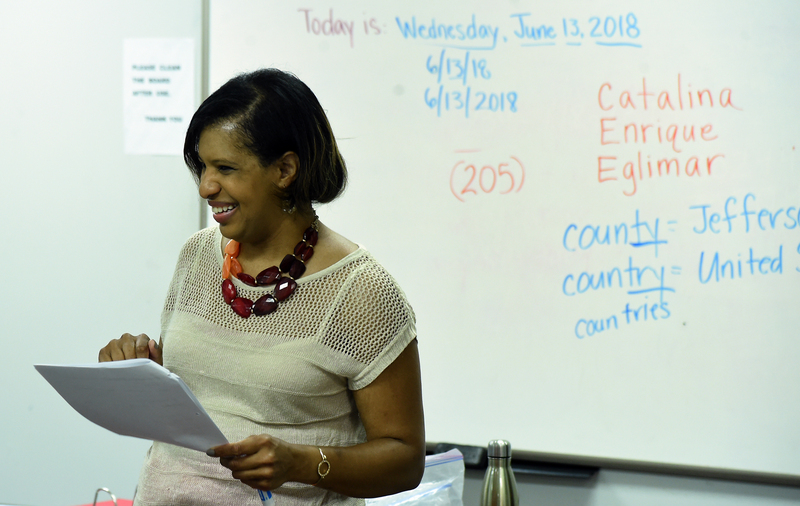 Stephanie Lyas, TLC Director of English for Speakers of Other Languages (ESOL) and Field Programs, is spending her Wednesday away from the organization’s downtown Birmingham office. She is filling in for a volunteer tutor at La Casita, a multicultural services agency in Homewood. “What is tomorrow?” she asks an eager group of non-native English speakers, including a mother and her two children from Venezuela. The response—“Thursday”—sounds slightly different from each person. Most of the learners speak Spanish, but there is also a woman from Pakistan, whose native langue is Urdu, and a man from Brazil, whose native language is Portuguese. In its earliest days, TLC focused on teaching English to non-native speakers. And lately, the metropolitan area has seen great increases in non-English speakers. The increased programming is in response to the demand from schools, churches, and the general public, Lyas said. TLC plans to add at least four new programs this fall to keep up with the demand. While most of the learners come to TLC on their own, some companies refer workers to the organization’s programs, possibly suggesting a need for improved literacy in the workforce. TLC points to this statistic: illiteracy costs U.S. businesses and society at least $225 billion annually because of lost workforce productivity, crime, and unemployment. Also, workers who have trouble reading are less likely to seek promotions and may be more likely to compromise workplace safety, officials said. To that end, Watson in her role as executive director, has been reaching out to companies to educate them on services TLC could offer workers. American Cast Iron Pipe Company (ACIPCO) sits in the same North Birmingham neighborhood as the new Salvation Army facility where TLC now offers classes. ACIPCO Communications Manager Joy Carter, who recently joined TLC’s board of directors, said the council is now in the early stages of creating a program to address the needs of workers who may need help reading. TLC Director of Initiatives Steve Hannum said improving reading skills and earning a GED diploma could help someone move from a minimum-wage job in a restaurant kitchen to a career that pays significantly more and offers benefits. Hannum is spending an afternoon with 41-year-old Kendrick Brewer at TLC’s newest site in North Birmingham—the Salvation Army Center for Hope, which houses programs that help people rebuild and become self-sufficient. Brewer said he is working toward his goal of enrolling in college to study computer technology. He knew he needed stronger reading skills before he could move forward, and he now takes the classes twice a week at the Salvation of Army Center for Hope. “This is a start to building my future,” Brewer said.